Add a touch of modern styling to any outdoor area using this cube wall bracket. 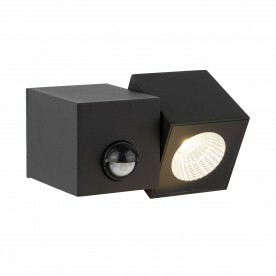 The quirky and cubed design provides one bright beam of light to perfectly illuminate your garden. The direction of the light is fully adjustable. As a recommendation, purchase with item 1422-2BK. A PIR sensor has been added as an additional security feature. Upon sensing motion, the PIR sensor will cause the light to illuminate.